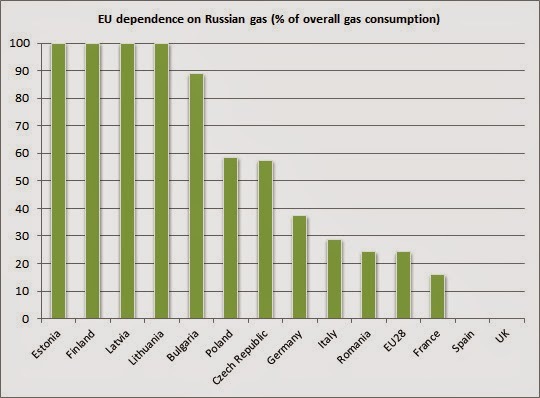 Finland gets its gas if I am not mistaken not via Ukraine. Hard to see Russia stop pumping gas in general (unless the EU makes an even bigger mess of it than now). They much more likely let Ukraine make a mess of it, which is more or less a guarantee. And Russia would have deniability. Wouldnot be surprised if they put pressure on it to let the EU as the new owner pay the outstanding bills of the Ukraine. What was said about the demographic shock that were to happen when the baby-boomers retired? Drastic shortage of workers? Baby-boomers have retired, is there a shortage of workers or are we looking at high unemployment? The periphery has drifted North. Babyboomer is largely about too few people paying in while too many receive. It is much less about a shortage of workers and/or unemployment. High unemployment now means 2 problems. 2) unemployment sec. (before there was only one a temporary high unemployment). Both have a budgetary effect. Unemployment only (hopefully) temporary. Aging however permanent. Even if unemployment/shortage of labour would not be an issue. Most Western countries would over 30-50 year have to come up with 10-20% of GDP (annually) to cover the costs of aging (unfunded pensions and higher healthcare costs mainly). In some countries the problem has already started Like Germany. Countries like Finland and Holland it starts to hit in now. Countries like Ireland it will hit in later. With Ireland now having to cope with large emigration (that works the other way around). When the problem starts to hit in at the revenue end tax income will fall away as well (on top ogf the higher expenditure). Simply fewer people working and paying in. Both effects are 1% or more of GDP annually (as an increase). 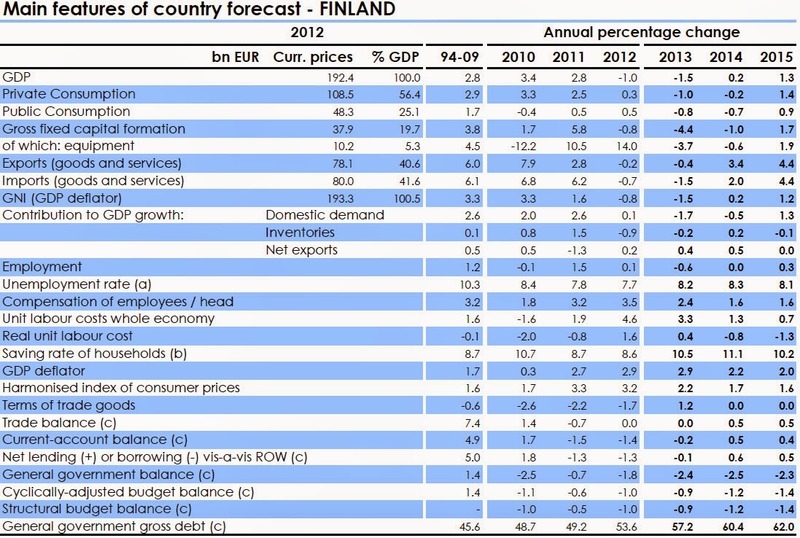 In countries like Finland that have the EZ hanging on their feet and with a structural growth of say 2% annually pre-crisis. Half your growth would be structurally spent beforehand this way. Add the EZ problems and lower worldeconomy growth and nearly all growth might be gone. Meaning as the economy will keep going in cycles half the time de facto there would be a recession. Add a move from middleclass income to high end income and it is a pretty ugly picture. GDP might still rise but it won't be shown anymore in people's pockets (living standards) because of higher taxation because of old age spending. Add decreasing middleclass incomes and it gets very ugly. Most people will see lower spending power while as said GDP might still be rising. What I am missing on the Ukraine reporting in general. Everybody seems primarily occupied by blaming other people. -That the credibility of the present Kiev government in the East seems almost non-existent. Which is btw different from wanting to join Russia. You simply donot get that back again. It is F-ed big time. When credibility/trust is F-ed it is nearly impossible to get it back. Not only their acts (and their dodgy allies), but also one saying A the other saying minus A. One day this the next day the opposite. -Lot of weapons around and a lot of angry men for hire (deserted soldiers/police etc. Caused by being not or not properly paid as soldier or policeman for a lot of them). -Looks like the oligarchs are starting to hedge their positions. Completely logical but got no attention at all in the media. Looks to me that they are nearly certain the main financiers of these violent groups. Paying demonstrators or like here troublemakers is nearly always a local affair (or via intermediates, Putin never would be so stupid to let a German government sponsored NGO do the paying, like in Kiev). And no way you want to be a pro-Kiev oligarch in eastern Ukraine now. -Groups look a mixed bunch anyway. Nearly certain a lot of volunteers. 70-80 year old grandmas are no nercenaries. But more important it is weekend stuff for a large part. Points clearly in the direction that at least the weekend warriors are not paid. Looks like an irreversable process now. You get a federation like structure. Either now or after a lot of shooting (so probably after a lot of shooting). This is likely next months if not already this months PR debacle of the Cameron government. Looks to me they simply make way too many mistakes. Most important in general not connecting in any way with their traditional voterbase. This is one that could play over several months, and Hague is digging himself deeper in by the day. From relative outsider he has become one of the frontrunners (wannabee international statesman). This has PR disaster written al over it. It is not a culture minister disaster which blows largely over in a month or so and only erodes a general positive perception. This is long term stuff and with the idiots now governing as a sort of EU ally the country and messing things further up by the day a thing that alone on event basis would get worse (by the day as well). Not even to mention the fact that that we are not far from you, the UK having to pay. Having to pay to stabilise the Ukraine will simply not be accepted as an excuse for cuts or similar at home. Wait on top of that till the first of them arive in London and go for entitlements (always a paper that reports on that and now full in the spotlights). In a nutshell: re EU reneg Cameron is still the by far best bet, but an increasingly bad one. The Tories are simply a complete PR disaster. They have more than half of all the major electoral calls wrong. Which is an achievement in its own right. No way you restore credibility lost earlier this way. You might want to read up on it before you comment on it. Healthcare costs aren't growing wildly either, thank the patent cliff for that one. And possibly also the effect of bad diets combined with sedentary lifestyles.